Here’s a list of CHDs and hospitals open for applicants. The Department of Health (DOH) officially opens the application and recruitment for RN Heals 4 for 2013. Midwives and Nurses can apply in the said program. RN Heals 4 — Batch 2013 recruitment and selection will start on October 29, 2012 and will end in November 29, 2012. 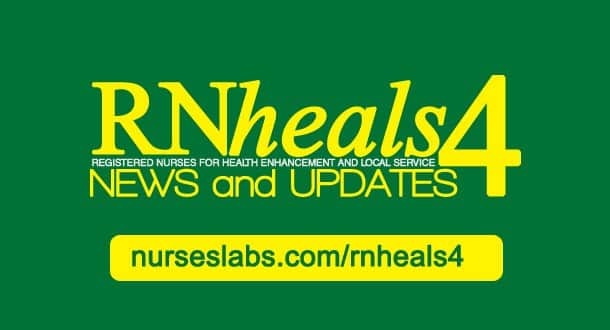 In this article, you can download the RN Heals 4 application forms. This is the official application form for nurses applying for RN Heals 4 batch 2013. Click on the Download button below and print yourself a copy. This is the application form midwives who want to join the Rural Health Midwives Placement Program (RHMPP). Click on the Download button below and print yourself a copy. With that alone, we hope that it cleared the fog of speculation among nurses if there will be an RN Heals 4. Yes, there will be. As of now, there is no official memo about the guidelines and requirements. This post, entitled RNHeals Ultimate Guide, will help you from application letter writing to employment. The DOH released the approved distribution list for DOH Hospitals. On the first column, you’ll be able to see which hospitals all throughout the Philippines that are accepting applicants for RN Heals 4. The last column shows the number of slots or number of nurses they are suppose to hire. 14 Corazon Locsin Montelibano Memorial Regional Hosp. 19 Don Emilio del Valle Memorial Hosp. 20 Don Jose S. Monfort Medical Center Ext. Hosp. The Department of Health released last October 29, 2012 the Department Order No. 2012-0184 (DO 2012-0184) which states the guidelines for the implementation of the Registered Nurses for Health Enhancement and Local Service (RN heals) Project Batch IV. DO 2012-0184 lists the specifics and implementing guidelines of the RN Heals 4 for 2013. This guideline is more specific than the previous one. RNheals nurses are not ’employed’ but rather are intended for learning and development. Nurses under the program are not regular employees but pre-service trainees. They are given stipend/allowances not salaries. RNheals 4 tour of duty will be from January to December 2013. Nurses will be assigned in DOH Hospitals (Hospital Setting) or Rural Health Units (Community Setting. Stipend/allowance for RN Heals 2013 is still 8,000 per month with PhilHealth and GSIS Insurance. Nurses are to be awarded with Certificate of Completion after satisfactorily completing the RNheals program. RN Heals 4 Recruitment and selection period will be from October 29, 2012 to November 2012. Application forms shall be submitted directly to CHDs for community setting and DOH Hospitals for hospital setting. Learn how to apply, with this guide. ONLY NURSES WITH PRC LICENSE are eligible to apply. Nurses who have previously engaged in RNHeals are not qualified to re-enter the project. In case of absences, a fixed amount of Php 363.00 per day shall be deducted. Stipend shall be given on or before every 10th and 25th day of the month. Eight training hours per day shall be completed by the nurse. Subject: Guidelines for the Implementation of the Registered Nurses for Health Enhancement and Local Service (RNheals) Project Batch IV. The Registered Nurses for Health Enhancement and Local Service Project otherwise known as RNheals Project was conceptualized in response to the country’s constitutional mandate to make essential health goods and social services available to all Filipinos, especially the poor. The Order aims to standardize the implementation, monitoring and evaluation of RNheals Project Batch IV at all levels. Strengthen nurses’ capabilities in the DOH Hospital and Rural Health Units as a form of technical assistance towards the delivery of the DOH thrusts in a well-coordinated manner. Create a network of nurse preceptors in health facilities both in the DOH hospitals and RHUs to maintain quality and standards of nursing competencies. Utilize a comprehensive competency based curriculum that blends both learning and development. Structure a targeted recruitment and selection process to minimize attrition of nurses. Award a Certificate of Completion to nurses that will satisfactorily complete the project. RNheals nurses shall be assigned in DOH Hospitals or RHUs as pre-service trainees for one (1) year from January to December 2013. A distribution list shall be provided by the HHRDB to all CHDs and DOH hospitals through their cluster heads per RHUs and DOH Hospitals. The CHDs shall finalize/reallocate the distribution considering capacity of accepting trainees/situation of receiving units/municipalities. The nurses under RNheals shall receive a monthly allowance/stipend of Php 8,000.00, PhilHealth Insurance premium of Php 2,400.00, GSIS Group Personal Accident Insurance premium of Php 500.00 and additional monetary or non-monetary benefits from the recipient health facilities. After the satisfactory completion of their learning and deployment, the nurses shall be awarded with a Certificate of Completion. The Center for Health Development (CHDs) through their respective cluster heads in close collaboration with the HHRDB and stakeholders shall monitor the implementation of the project. Recruitment and selection period will be from October 29, 2012 to November 29, 2012. The Centers for Health Development and DOH Hospitals shall set their timelines for accepting applications and selecting the pre-service trainees within the prescribed period. Applications shall be submitted directly to the Centers for Health Development for RHU applicants and DOH Hospitals for applicants interested in hospital training. Applications received by the RHUs, PHOs and DOH Central Office shall be forwarded to the respective Centers for Health Development and DOH Hospitals accordingly. Applicants shall undergo the recruitment and selection process by the CHDs for RHUs and DOH Hospitals in coordination with CHD-HRDU. Nurses must be physically and mentally fit. A medical certificate from a government health facilities is required before the start of training. Priority shall be given to nurses residing in the localities where the recipient rural health units/hospitals are located. Nurses who have been previously engaged in RNheals are not qualified to re-enter the project. Verification of previous RNheals shall be done via internet at www.doh.gov.ph/rnheals. Names of officially accepted applicants shall be forwarded to HHRDB through the CHDs/DOH hospitals for proper documentation on or before December 15, 2012. The duration of training will be from January 2013 to December 2013. The Php 8,000.000 allowance/stipend shall be given in full for pre-service trainees that has completed the number of training days per month. In case of absences, a fixed amount of Php 363.00 per day shall be deducted regardless of the number of training days per month. The stipend shall be released on or before every 10th and 25th day of the month. The RNheals nurses shall submit their Daily Time Record (DTRs) as basis for the allowance/stipend. This shall be duly approved by the Public Health Nurses/Municipal Health Office in the RHUs or Supervising Nurse/Nurse Training Office/Chief Nurse in the DOH Hospitals. The RNheals nurses shall undergo the Pre-Deployment Orientation prior to assumption of their assignment. The RNheals nurses shall sign a training agreement in pursuit of their commitment to enhance their competencies and complete the project. RNheals nurses who completed the training shall be awarded with a Certificate of Completion signed by the CHD Director or Hospital Chief as appropriate. Otherwise, they will only receive a certificate of attendance. The RNheals nurses are required to complete eight (8) training hours per day. Night duties are strictly not allowed. They are likewise paired with at least a regular staff nurse/public health nurse as a mentor/coach. The RNheals nurses shall be evaluated after module/rotation to measure their progress during the training period. The HHRDB shall prepare a comprehensive competency based curriculum guide for the DOH Hospitals and RHUs. Prepare the RNheals competency based curriculum guide for the DOH hospitals and RHUs. Lead in the monitoring and evaluation of the project through the Regional and Provincial Management Team and submit the Fund Utilization Report, Program Implementation Review Report, Monitoring Report including competency assessment of the nurses and list of accepted RNheals to the DOH Central Office. Provide the nurses with Certificate of Completion after the satisfactory completion of the project or a Certificate of Attendance as appropriate. Ensure the enrolment of nurses to PhilHealth Insurance and GSIS Group Personal Accident Insurance at the start of training and provide additional monetary or non-monetary incentives to nurses in any of the following but not limited to: training opportunities, training allowance, meals or meal allowance, transportation or transportation allowance, communication allowance, modest board and lodging whenever necessary. Prepare and submit reports as prescribed by the project. Just like with other job openings, RN Heals requires you to write an application letter accompanied by your bio data or resume. Application letters should be written in a presentable paper, neat and nicely designed. Also, it should fit in one page and the objective is to attract the reader to your letter. Application letters (sometimes referred to as Cover Letters) are very easy to write as long as you know the basics. Dr. Rosanna M. Halum M.D. I have heard that there is a job hiring in your office, I am interested to apply as one for any job vacancy offered. I am RONALD MENDIZABAL FULLER, 2 yrs of age, single. I graduated from Our Lady Of Fatima University, Q.C. with the degree of Bachelor of Science in Nursing on March 17, 2007 and has passed the nursing licensure examination . I experienced worked as a nurse trainee at Gubat District Hospital, Gubat, Sorsogon on 2008. Worked as a Nurse at Gubat District Hospital, for six months and six months on Rural health center at Bulusan, Sorsogon thru the Registered nurse Health Enhancement and Local Services(RNheals) program by the Department of Health. Attached herewith is my resume for your perusal. I should sincerely appreciate the courtesy of an interview at your convenience. I take pleasure in exploring the possibility of offering my services to your esteemed institution as Registered Nurses for Health Enhancement and Local Services (RN HEALS) under Department of Health. I received a degree in Bachelor of Science in Nursing from one of the respected catholic school in Ilocos Norte, Philippines, Divine Word College of Laoag. I was able to complete the required Related Learning Experiences. I took the Nurse Licensure Examination last July 2011 in San Juan de Letran University, Manila and passed the said examination. I am energetic and hardworking with the ability to adapt to the environment easily, have excellent communication and demonstration skills. You will find my additional qualifications in my resume. I would like to develop and enhance more of my skills as a professional nurse in your institution madam. It has come to my realization that it would prove more helpful in my career if I’ll try to explore other challenging work opportunities, where I could be better able to utilize my skills and abilities, and at the same time welcome a novel learning process. This will be possible if I will enter in your prestigious institution. I am hoping that my experiences with your institution will shape me to a more responsible and service- oriented professional. I have attached a copy of my resume for your kind perusal. Just talk to the heads about this if they can consider your application. Because last batch, this was possible. bat ayaw po maopen ang region 10 link? SAN DOH KA NAGPASA S STA.CRUZ PO BA? Hi!! Just in case po na mag require po cla ng PRC ID.. since, my PRC ID is still on the process pwede po ba yung claim slip muna?? kasi dito sa Iloilo 6-8 months pa po namin makuha ang PRC ID.. Pls. response po..tnx.. Godbless..
Sabi, needed na daw nila prc ID by december. Kung wala pa, baka hindi matanggap, priority nila yung may prc id na. how sad right? ang RNHEALS 4 ba ay hospital?? o community po?? kanino po iaaddress yung application letter pg taga cabanatuan????? Sana nga I want to serve my countrymen first before my self. OPEN N PO B ANG REGION 2 FOR COMMUNITY RN HEALS 4? open na po un sa region 5 rnheals 4? open na po bah ang sa region 12 rnheals? Yes, open po sya until November 30.
close na ung sa fabella and East Ave.. tried to submit my credentials but they dont accept anymore. On all CHDs and DOH Hospitals. Resume and application letter. paano po ang online application?…. Wala po atang online application for RN heals. Wala po atang online application. They will call you po, on the hospital that you’ve passed your application to. may rhu ba sa rnheals 4? Meron po! Both hospital and RHU are open for application. For Hospitals, go directly sa mga hospitals, for RHU go to the CHDs. Open po ba ang rnheals 4 region 10 rhu? Yes, until November 29 po. Yes, open po until November 30.
sir,Pwede po bang mag’apply yong RNheals bacth 3 na midwife naman po yong possition pero sa RNheals 4 naman po ay nurse na po yong aapplyan po na possition? Pwede po un! Possible po. Bawal lang is if you are a RNheals nurse then and applying again as such. tact po mo sa DOH na nagsasabing pwede po? open pa ba rnheals4 sa poc,east ave,fabella? RNheals application in East Ave and Fabella is closed na po, unfortunately. Unfortunately, closed na po ang application since full na po ng applicants. paano po malalaman if nakapasok ka sa RN heals 4? ang hospital na inaplayan o DOH po ba ang tatawag? They will call you or text you that’s for sure. anong type po nung exam tas tungkol san? The usual nursing stuff and something about the program. good pm po… nag apply po kasi ako sa region 7 rn heals 4.. saan ko po ba malalaman f kailan ang schedule ng exam ko?? open na po ba ang region 8 rnheals? kailan ang deployment sa region 8 rnheals? kailan po start bg exam sa region 3?? is it true po ba na mag i-increase ang salary ng rnheals? from 8k to 13k? when will the DOH post the successful applicants for this RN heals program? any date? Thanks & regards!!! kapag nag Rnheals batch 2 kana, pwede pa ba mag batch 4? meron na po bang list of successful applicants sa batch 4 sa siquijor? hello po…paano mag apply nang rnheals?,leyte po ako nakatira ngayon.saan po akoh mag aaply..midwife po ako!!salamat. any updates for the successful applicants? tatawagan daw po pag ntanggap na sa rnheals 4. nagaalala po kmi if kelan po ba kasi till now wala po po kming balita.. WHEN WILL YOU POST THE SUCCESSFUL APPLICANTS FOR RNHEALS 4 FOR BOHOL? good evening po ask q lng kung kelan po ung result ng successful applicants sa rnheals sa region 4?thnx po ng mrmi..
hi. when are we going to have the next batch and when is the application for this? kahit tentative date po sana. thanks. hi poh ask ku lng pu if pwede pa mag aply d2 sa cregion CAR spxaly d2 sa benguet…thanks..happy new year. Hi! Ask lang po. Meron na po ba official list ng successful applicants for RN HEALS 4? Preferably Pampanga area po. Thanks. GOD bless. good day po .. kelan po malalaman yung list ng rhmpp ? tahank you po . kelan po e’popost yung list ng rhmpp ? thank you po. Kung nagtatanong tayo sana may sasagot, much appreciated kung ang nurselabs ang sasagot.. Kailan po malalaman kung sino ang mga natanggap na aplikante sa RNheals Region 8? gud evning po.. kailan po nxt hiring sa region 10? tnx po..
kelan ba ang deployment ng sa 4a? meron pa bang mag-oopen na schedule for application this 2013? thanks po..
san po pede makita ang list ng hospital ung pede pa mag apply? may open pa ba na hospital within metro manila area? tnx. open pa po ba until now ang application sa rn heals? good pm..pwede pa po bang mag.apply sa rnheals?particulary sa region 8? Closed na po ang application. Application ended last November pa.
ganun po ba..when po mg.open yung next batch sa region 8? good day po!!! pwede pa po bang mag apply ng RNHeals4 particularly sa LEYTE po? good day…kaylan po kaya ang start ng appilication for rn heals 5? good eve po… open pa po ba region 12 or ARMM??? mag aaply po sana ako, Midwife po…. A newly passed nurse here. When will be the start of the next batch of RN Heals 2013 (RNheals5) ?? Thank you. how bout ung region 8? open pa? good pm poh..ask lg poh aq qng meron pa pong open na slot pra sa rhmpp dto poh region 6..salamat poh..
Meron ho poh bang RNheals vacant sa Bukidnon.? hi gud eve po, ask lng po wen ulit magkakaron ng opportunity for RN Heals ang mga taga Region IVA, specifically Cavite areas… Newly board passer po and want to have an experience on this. Hope to hear from you. Thanks po & God Bless. How can an individual’s profile be removed permanently from the RN Heals website?! pwede na po ba mag apply for next batch sa 2013 or 2014 next year? any news regarding RN Heals 5? When will it be available? Thanks. Hi. Meron po bang rn heals batch 5 or rn heals 2014 sa pangasinan? And when is the application date? guys cnu po may alam kilan ang nxt batch for rnheals davao city or davao del norte. update me asap thx….